Looking for the best Birding trails around San Luis Obispo? Find the top rated birding trails in San Luis Obispo, whether you're looking for an easy short birding trail or a long birding trail, you'll find what you're looking for. Click on a birding trail below to find trail descriptions, trail maps, photos, and reviews. 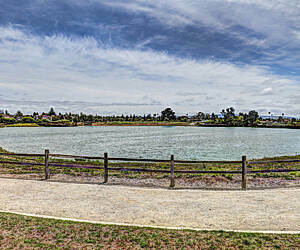 For beautiful panoramas and photo ops, the Morro Bay Harborwalk is tough to beat. The path is usually full of tourists, but that's OK. It makes you slow down to enjoy the majesty of Morro Rock, the shimmering waters of the bay, and the antics of frolicking sea otters. To make this into a lengthier and more substantial bike ride, we parked and unloaded our bikes up the coast a bit at the Morro Bay Sunset parking lot on Azure Street. We then enjoyed a leisurely ride down a Class I bike path for maybe a couple of miles. You'll pass through a park and go by Morro Bay High School. Eventually you'll come to quiet Atascadero Road where you'll turn right. The road will dogleg into Embarcadero which leads straight to the Harborwalk. Yes, you have to ride on the road for a mile or two, but the roads had little to no traffic. All in all, a fun time was had by all on these mini bike paths, perfect for a couple of sixty year olds. BTW: If you're looking for something a bit more substantial near Morro Bay that's not on R-T-T, then go down the coast to Montana de Oro State Park and hike or ride your bike along the bluffs on a wide, hard packed dirt path overlooking the ocean. Talk about spectacular photo ops! Trail gated off at N. Blosser Rd. I just rode the entire trail and found that the western end of the trail is gated off at N. Blosser Rd. A sign on the gate shows "No trespassing" on the levee. Trail is mostly hard packed gravel. There's good parking at the East end of the trail. Exit 101 and go toward Avila. Turn right at the first road (about 1/4 mile) and go over the bridge. The beginning of the trail is on the left and the parking is on the right. There is now a camera on a pole and the parking lot is patrolled due to thefts last year. The trail itself is fairly well maintained except for an area where roots have affected the asphalt. The trail gets very crowded on the weekends and holidays between 9 am and 3 pm. There are dog walkers, joggers, kids and families riding bikes, and people walking. It's a good idea to have a bell. Parking and starting in Avila is more difficult as beachgoers will take up the parking, especially between 9 am and 2 or 3 pm. It is possible to park on Winter weekdays. The County is extending the trail to connect it with downtown. I walk this trail on the weekends with my dog, and I see so many people out there. The view of the land is BEAUTIFUL and so worth the walk. It's peaceful and safe. I am so glad I walked this trail. It's good for bikers too with more than enough room for everyone. Come out and enjoy this trail!! At the south end of the trail you will come upon Waller Park. This is not a trail, but the ride throughout the park is far better than the trail itself, which has no real draw, except that it is a designated two lane bike trail. Riding through the park, which is full of beautiful pines, lush green lawns, a small pond, and minimal, 10 mile per hour, traffic. At keast that was the case when we rode in the late afternoon. A great place to stop for a picnic lunch. This is a day use park, so there are bathrooms, tables, etc. I understand that the trail starts on SLO. I took the shorter southern route starting from the 101 to Avila beach. Very shady as it winds alongside SLO creek. There is some kind of resort about halfway through that has some resting areas. On a hot summer day, this ride is cool, shady and nice. Something new in addition to the intersection - a bit of trail at the bottom of the sewer plant. Gotta check this out. Come about, park and walk up to see. It extends the trail from the triangular settling pond at the south end of the sewer plant (or - waste water treatment facility) down to the intersection. Here you pick up a bike lane for the ride down to the Johnson Ranch trailhead. From there you share the frontage road down to the upper trailhead at the Avila Beach section of trail. The new section features a bridge over a small creek, an info kiosk with map and a parking stall for maintenance vehicles. Short, but nice. Now you can ride from sewer to the sea. Enjoy. I rode a section of the trail from Bull Canyon Rd to Preisker Park. Since this trail also serves as route for levee maintenance vehicles, it was a wide, compacted gravel surface with minimal slope. I rode a MTB but a road bike would do OK on this trail. My biggest problem with the trail was, as a visitor, I could not find trail heads with easy access to the trail. I ended up lifting my bike over a fence along Panther Drive. I am confident locals have no problems once they explore the trails in the region. I must admit I was frustrated with getting lost. Signage would improve the trail experiences for destination riders from other areas of the country. For my cross country (Canada-Mexico) via trails only ride, I needed to go from 35:23584 to 35.3030 degrees latitude (4.7 mi). With this trail being only 1.5 miles, I had to ride, streets and sidewalks from RFK Library on the Cal Poly-SLO campus to the county airport. 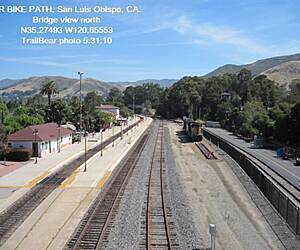 The RR Safety Trail is short and not well marked, especially as to which side of the three tier overpass bridge one needed to take to get on the SLO Railroad Safety Trail. A runner that was coming off the bridge said I needed to cross to the west side of the tracks. After wheeling my bike up the ramps and across the bridge, I could see the trail was actually on the east side of the tracks. So back up the ramps, across the bridge and down the ramps to the trail I went. Some homeless folks along the safety trail were into hard begging so I rode as fast as I dare to get away from them. I guess I expected a longer trail and no hassle from the "did not stay at the Holiday Inn Express" crowd, so I was not impressed with the trail situation in SLO. 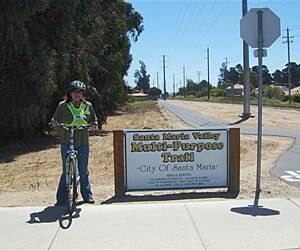 For trail riders it appears it will be a long time before SLO has destination bike trails. It's too bad given it is a beautiful area including an interesting old town area and a large state university. Come on SLO, get some some more safe trails built and include signage for the out-of-towners. If you had destination trails, you might find people from other states and countries spending money there. TrailBear is back on the Bob Jones again, this time on a comfy trike by HP Velotechnik. It's like riding a recliner. Pure comfort. The Bob Jones Trail down at Avila is a charming ride, but a tad bit short. This time TB started the ride several miles further on - out at Port San Luis and added 2+ miles of riding and lots of scenery. Just head through town and out to the port on Avila Beach Drive. There is plenty of parking and all sorts of attractions out at the pier(s): restaurants, fishing, boat rentals, day boats, camping, shopping. He pulled the Scorpion FS trike out of the van, unfolded it, mounted the panniers and electronics and was off to poke about the port, then head back to Avila along the the beach drive. If you have an RV, there are a number of pull outs that offer camping - virtually waterfront and very scenic with large views over the bay and way down the coast. It was a glorious sunny day - a great day for a ride. When you cross the bridge into Avila and pass the beach park (restrooms, water, views, etc. ), look left at the first stop light (which appears to be a new one). This is the trail end. The trail now runs in a sunken lane on the far side of the street and now skirts the waste water treatment plant on the left side, vs. the old way via the parking lot there. They have put up a new arch at that point. From there it's the same trail - over the golf course bridge, a bit of road, etc. down to the trailhead near the highway. Slow down, relax and enjoy the unfolding views. TB had to. Lots of peds on the trail. Lazing about on his trike. 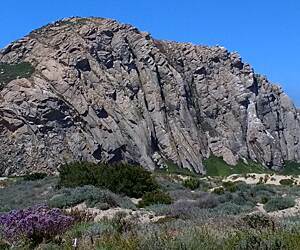 There are two bike trails in Morro Bay and this is one of them. It comes in two parts, anchored by the Cloisters Park. 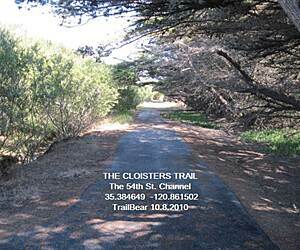 The Cloisters Trail is a little community trail. The name commemorates the Cloisters Inn that was on this site from 1925 to 1945. You won't get much mileage here. In fact, there are very few miles of bike trail in the central coast. You have to take to the roads for distance. The trail comes in two sections: behind the dunes and behind the power plant. The dunes section runs behind the dunes with two sand access trails out to beach itself at either end. The northern end is anchored by the full service trailhead (restrooms, water, parking) at the end of Azure St. (GE: 35.392620° -120.863434°). From here you can take the sand trail out to the beach or the blacktop bike trail south to the Cloisters Community Park. The trail crosses the back Cloisters Park and then along the 54th St. Channel (bio-engineered - read the sign) to end at the back of the sands - behind the high school. 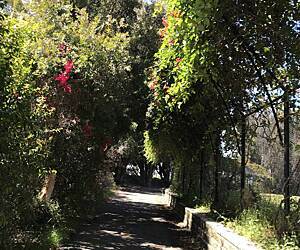 Retrace your track to the Cloisters Park - another full service trailhead and more. Take the trail along side the tot lot, cross the parking lot, cross the access road and there is the opening to another section of the trail. This goes behind everything the first did not. Cross behind the homes and over the 54th St. Channel and now you are behind the high school. Work your way out to Atascadero Rd., cross as the crossing and head for the Coast Highway. Turn at the side of the Morro Shores Inn and there is the trail again. Now, in order, you ride behind the motel, behind Lila Keisler Park, behind the switching yard of the power plant, and behind the hill to end at the junction of Quintana and Main St. Notice the unfinished building project on your right side. Head up Main St. and over the hill (bike lane). Turn right on Beach and head down to the harbor. Ride the Embarcadero towards the power plant. Across the street from the plant is the lower trail head of the Embarcadero Trail. It's about a half mile, but very scenic as it follows one side of the entrance channel out to Morro Rock and Morro Strand State Beach. Come back and work your way across the waterfront down to Tidelands Park (GE: 35.359486 -120.851508) at the far end of the waterfront for more views. This marks the end of the channel and the mouth of the estuary. Quite a nice trip on a sunny day. You can tell the state of the tides by looking at the anchored boats. They clock around as the tides turn. The currents run strong in the channel. Montana del Oro State Park - which also has good mountain biking. Triking down the channel trail.